Unsweetened and with natural flavours. Captured at the source in France. With a hint of natural lemon flavouring and other natural flavourings. Drink Perrier the natural refreshing sensation. With only 2 calories per 50cl bottle. Our product is free from additives, artificial colours and preservatives. 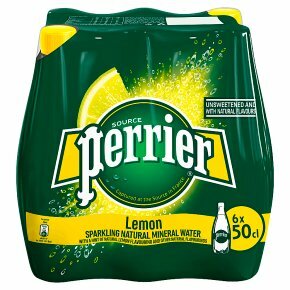 Unlease the force of Perrier Sparkling Natural Mineral Water with a hint of lemon flavour, the perfect thirst-quencher to liven up your day. With natural flavour, no sugar, no sweeteners and just 2 calories along with Perrier's extraordinary burst of bubbles, there's no easier way to satisfy your sweet tooth, guilt free. So, zest up your day! Keep these invigorating bubbles chilled and enjoy anytime of the day!